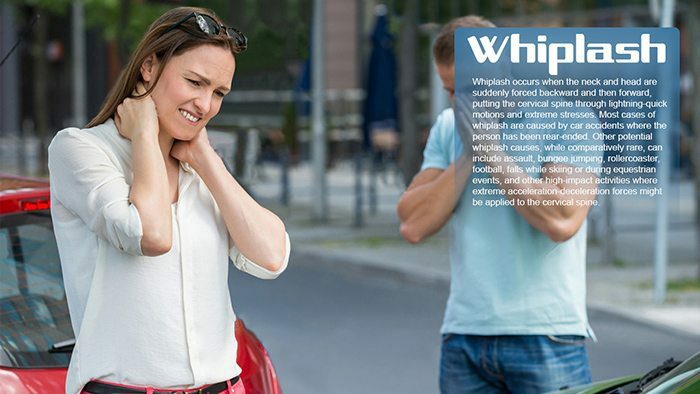 Whiplash is a collective term used to describe injuries to the cervical spine (neck). This condition often results from an automobile crash, which suddenly forces the neck and head to whip back and forth (hyperflexion/hyperextension). Almost 3 million Americans are hurt and suffer from whiplash annually. Most of those injuries come from auto accidents, but there are other ways to endure a whiplash injury. 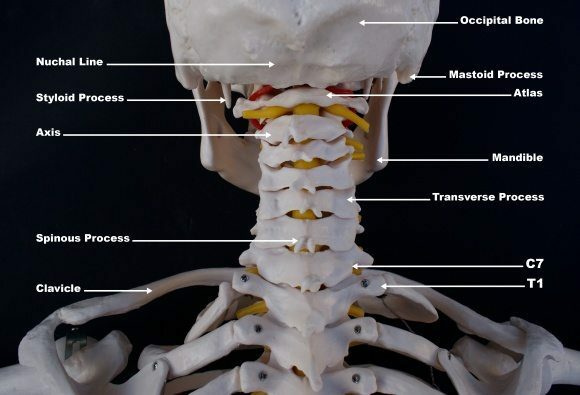 The neck consists of 7 cervical vertebrae (C1-C7) held together by muscles and ligaments, intervertebral discs (shock absorbers), joints allowing movement, and a system of nerves. The complexity of the neck’s anatomy coupled with its diverse range of motion makes it susceptible to whiplash injury. and in rare instances difficulty swallowing. Symptoms can appear within two hours after injury. Muscle tears may present themselves with burning pain accompanied by tingling sensations. 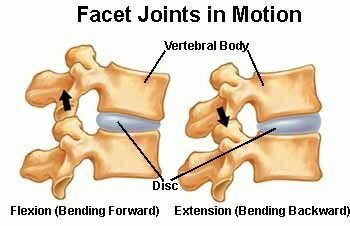 Ligaments affected by joint movement can cause muscles to defensively tighten restricting motion. ‘Wry neck‘, a condition that sometimes accompanies whiplash, occurs when the neck muscles cause the neck to twist involuntarily. Age and pre-existing health conditions (e.g., arthritis) may increase the severity of whiplash. As people age their range of movement declines, muscles lose strength and flexibility, and ligaments and intervertebral disks lose some of their elasticity. A physical and neurological examination is performed to evaluate the patient’s general condition. Initially, the doctor orders x-rays to decide if a fracture exists. Depending on the individual’s symptoms, a CT scan, MRI, and/or other imaging tests may be required to assess the state of the cervical spine’s soft tissues (intervertebral discs, muscles, ligaments). Most of us immediately think about car accident when referring to whiplash. You’re rear-ended as you sit at a stop sign, and your head flies forward, then backwards. It really does whip back and forth, so it’s a very accurate description of what happens. Doctors refer to whiplash, as a neck sprain or strain. 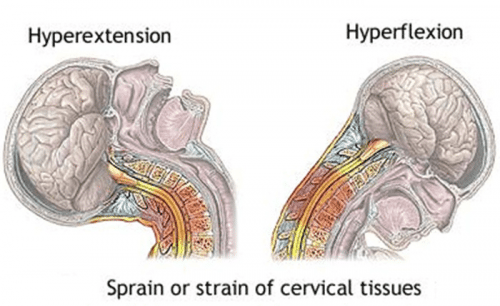 Other technical medical terms associated with whiplash are hyperflexion and hyperextension. When your neck whips backwards this is hyperextension. Hyperflexion is when it goes forward. Whiplash can take days, weeks, or even months to develop. You may think that you are all right after a car accident. But slowly, the typical symptoms (neck pain and stiffness, tightness in the shoulders, etc. begin to reveal themselves. So even if you don’t have pain immediately after a neck injury, you should see your physician. Whiplash may have longterm effects on your spinal health, and in the long run, it may be associated with other spinal conditions like osteoarthritis (joint and bone pain) and premature disk degeneration (faster aging of the spine). Soon after whiplash happens at the acute phase the chiropractor will focus on reducing neck inflammation utilizing various therapy modalities (eg, ultrasound). They might also use gentle stretching and manual therapy techniques (eg, muscle energy therapy, a type of stretching). The chiropractor may also recommend you apply an ice pack in your neck and/or a light neck support to use for a short time period. As your neck gets less inflamed and the pain diminishes, your chiropractor will execute spinal manipulation or other techniques to restore normal movement to the your neck’s spinal joints. Flexion-distraction technique: This hands on procedure is a gentle, non-thrusting kind of spinal manipulation to treat herniated disks with or without arm pain. The whiplash injury may have aggravated a bulging or herniated disc . The chiropractor uses a slow pumping action on the disk rather than direct force to the spine. Instrument-assisted manipulation: This is another non-thrusting technique chiropractors use. Utilizing a specialized hand-held instrument, force is applied by the chiropractor without thrusting into the spine. This sort of manipulation is useful for patients who have a degenerative join syndrome. Specific spinal manipulation: Here spinal joints that are restricted or show abnormal motion or subluxations are identified. This technique helps restore motion to the joint with a gentle thrusting technique. The gentle thrusting stretches soft tissue and stimulates the nervous system to restore normal motion. Instrument-assisted soft tissue therapy: They may use the Graston technique, which is an instrument-assisted technique using gentle strokes over the injured area of soft tissues. Manual joint stretching and resistance techniques: This joint treatment is muscle energy therapy. Therapeutic massage: Therapeutic massage to ease muscle tension in your neck. Trigger point therapy: Here hypertonic or tight points of a muscle are identified by putting direct pressure (with the fingers) on these specific points to relieve muscle tension. Interferential electrical stimulation: This technique uses a low frequency electrical current to help stimulate muscles, which can reduce inflammation. Ultrasound: Ultrasound sends sound waves deep into the muscle tissue. This creates gentle heat that increases circulation. By increasing blood circulation, ultrasound can help decrease muscle spasms, stiffness, and pain in your neck. How Does A Chiropractor Help Heal Whiplash? Chiropractors look at the whole person not just the problem. Each patient’s neck is unique, so they don’t just focus on your neck pain. They emphasize prevention as the key to health. Your chiropractor can prescribe exercises to help reduce whiplash symptoms and restore normal motion. Working with these chiropractic techniques, a chiropractor can help you increase your everyday activities. They will work hard to address any mechanical (spinal movement) or neurological (nerve-related) causes of your whiplash. Chiropractors are some of the only doctors who offer therapeutic treatments to accident victims. Treatment offered by medical doctors might include the use of medications, they may also recommend physical therapy. This highlights the importance of chiropractic care for whiplash victims because chiropractic and physical therapy are very similar forms of treatment. Whenever an individual who’s been involved in an automobile accident visits a chiropractor and complains of pain in the neck, the medical specialist will carry out a series of tests to determine whether the patient has suffered whiplash. Instead of focusing solely on the specific injury, chiropractors are trained to inspect the affected individual’s entire spine. Chiropractors can also request X-rays and MRI of the patient’s spine in order to find out whether the spine features any degenerative changes which might have developed before the accident. To offer the best possible treatment, it is extremely important to determine which problems existed prior to the accident and which ones resulted from the accident. In most cases, insurance companies may argue that every single injury in the victim’s body is preexisting. This makes the role of the chiropractor considerably important as they will make sure to document all the previous and new injuries separately to ensure the insurance company pays for the patient’s treatment. In addition, the evaluation performed by the chiropractor also allows them to create the most effective treatment plan for each individual whiplash victim.